The Copperhead, at 16 to 36 inches, is one of the smaller North American pit vipers, a close relative of the Water Moccasin and member of the group that includes the rattlesnakes as well. All of these snakes show a deep pit about halfway between nostril and eye. The pits of the two sides contain temperature receptors allowing the snakes to range in on and aim a strike at warm-blooded animals that pass in front of them. The pits are functionally similar to, but originated independently from, the temperature sensors seen in boas and pythons. 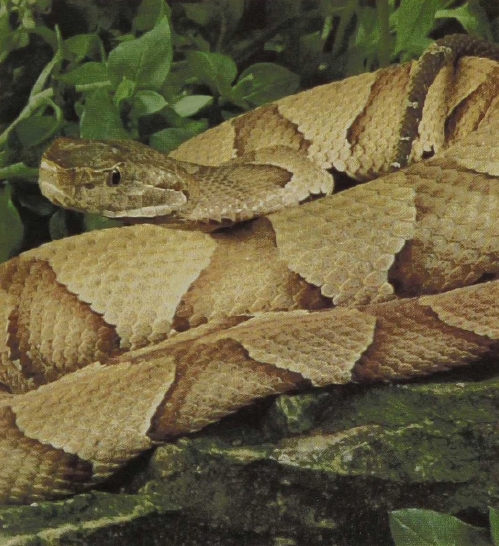 Copperheads, which range from the eastern United States west to Texas and Missouri, also feed on frogs and lizards and have been known to take even cicadas and other insects. It is a smaller snake than the Water Moccasin and its bite poses less danger, but both have a hemotoxic (blood-destroying) venom.